Elementary school children in the Democratic People’s Republic of Korea eat a nutritious meal provided by WFP (June 2012). The United Nations food relief agency has delivered food assistance to more than 140,000 people in the north of the Democratic People’s Republic of Korea (DPRK), where they have been affected by some of the worst floods in recent history – and expressed concern about their continued vulnerability as an extremely cold winter is approaching and major food losses are expected. “Whole villages have been washed away by flash floods. Families have lost everything, including their kitchen gardens and livestock, which many households depend upon to supplement their diets. The floods came just before the harvest period, when the crops were still in the ground,” the World Food Programme’s (WFP) representative in the country, Darlene Tymo, said in a news release. According to WFP, while the DPRK covers 120,000 square kilometres in north-east Asia, only about a fifth of the largely mountainous territory is arable. A harsh climate shortens the cropping season and degrades the soil, and natural disasters are frequent – for DPRK’s population of 25 million, this translates into a high degree of food insecurity. Current issues the country faces, and which WFP is helping with, include natural disasters such as drought and flooding, and chronic food insecurity and malnutrition, with more than 70 per cent of the population food insecure, and many people suffering from chronic malnutrition due to a lack of essential proteins, fats, vitamins and minerals. In the news release, WFP noted that the two northern provinces – North Hamgyong and Ryanggang –have the highest levels of food insecurity and chronic malnutrition in the country. The floods were caused by heavy rainfall in the two provinces at the end of August and in early September caused by Typhoon Lionrock. While more than 140,000 people have been affected, WFP expects that this number is likely to increase as some of the affected areas have not yet been accessed. People are in urgent need of shelter, access to clean water and health services, as well as food and nutrition assistance. To meet food needs, WFP said it has distributed an emergency food ration of fortified biscuits, for seven days, and soybeans, enough for 30 days, to reach 44,000 people. Following an inter-agency assessment of the affected areas, WFP rapidly distributed the same emergency ration to reach an additional 96,000 people. To meet urgent needs, WFP said it has used fortified food stocks in local factories that were destined for nutrition support to young children and pregnant and nursing mothers in other areas in the DPRK. To replenish these supplies and ensure children and women have access to the nutritious food they need, the UN food relief agency flagged that it urgently needs $1.2 million. In addition, to continue assistance in DPRK, WFP requires $21 million until August 2017. 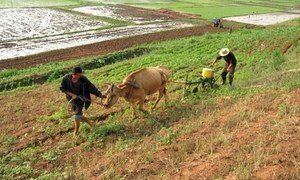 The total food production in the Democratic People’s Republic of Korea (DPRK) decreased by nine per cent in 2015, marking the first drop since 2010 due to drought and low irrigation water availability, the latest report from the United Nations Food and Agriculture Organization (FAO) showed today.